Here is a Thanksgiving card I created using Mojo Monday sketch #319. 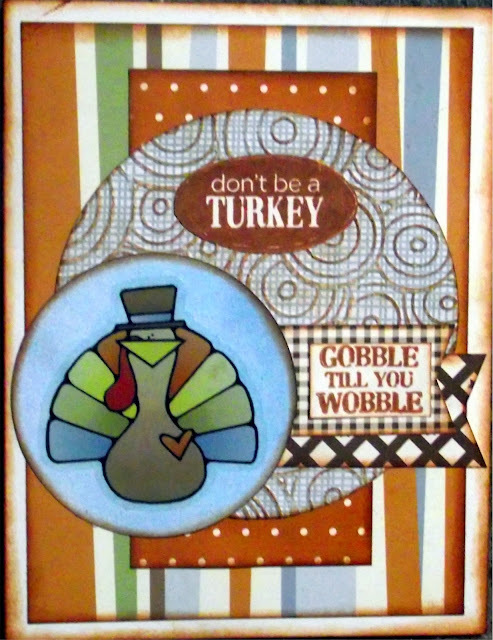 I am also entering this card into the Love to Create challenge #91 Thanksgiving/Thanks and There She Goes challenge TSG233 Thanks/Thanksgiving and Colorful Creations Theme Park challenge for the theme Delightful. I find humor delightful and feel this card is surely humorous. Now it's time to run out and do some errands. Hopefully I will get a chance to create again tonite after my meeting at church. Hope you are having a great day! Hope you will stop by and link up at Craftin Desert Divas “Thanksgiving” Linky Party. How adorable (love the sentiment!). Great color combinations too. Thanks for submitting it to the Thanks/Thanksgiving challenge this week at Love To Create. Good Luck! LOL! How cute!!! Thank you for sharing your project with us this week at Love to Create.